Communication Studies faculty and graduate teaching assistants are committed to helping our students reach their academic and professional potential through rigorous scholarship, a firm foundation in communication theory, and experiential learning. This past year, Dr. Sarah Riforgiate and Katrina Hanna both received awards for demonstrating excellence in teaching as well as a strong commitment to individual student development. Katrina Hanna, a graduate student in Communication Studies, received the 2016 Midwestern Association of Graduate Schools, or MAGS, Excellence in Teaching Award at the Master’s level. The award recognizes graduate teaching assistants who have excelled in classroom teaching and student mentorship. 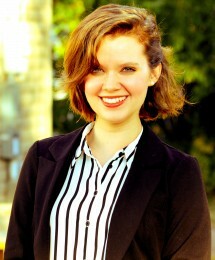 Hanna was nominated for the MAGS award after winning Kansas State University’s Graduate Student Council Award for Graduate Student Teaching Excellence by a Master’s Student. A master’s student and a doctoral student are selected by MAGS for their Excellence in Teaching Award each year. Each award recipient receives a citation and a $750 honorarium. Since the MAGS Excellence in Teaching Award was established in 2011, Kansas State University has had three winners. 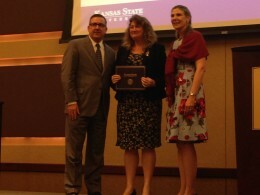 Dr. Sarah Riforgiate, assistant professor of communication studies, received the Presidential Award for Excellence in Undergraduate Teaching, which is one of the 2015 All-University teaching awards for Kansas State University. The Presidential Awards for Excellence in Undergraduate Teaching recognize compassion, dedication, and creativity in undergraduate teaching. The Office of the President and Curtin Property Co. sponsor three awards for faculty and one award for a graduate teaching assistant. Dr. Riforgiate teaches the classes Conflict and Communication, Communication and Leadership, Organizational Communication Theory, Perspectives in Communication. She is also the communication studies internship director, where she promotes experiential learning through applied assignments that help students understand communication theory in conjunction with internship work. Dr. Riforgiate has also mentored two undergraduate students to conduct independent research examining work-life boundary communication for individuals who live where they.